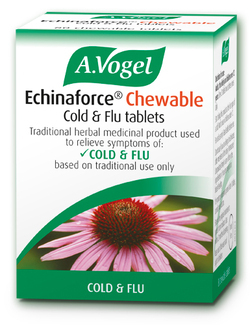 Echinaforce Chewable Echinacea is a traditional herbal medicinal product used to relieve the symptoms of the common cold and influenza type infections, exclusively based upon long-standing use as a traditional remedy. Echinaforce Chewable contains the same herbal extract of freshly harvested Echinacea purpurea that goes into A.Vogel's well known Echinaforce Echinacea Tablets and Drops. It may be used by children (above the age of 12 years) to help fight the misery of colds and flu. One tablet contains 380mg of extract (as dry extract) from fresh Echinacea purpurea (L.) Moench herb (1:12) and 20mg of extract (as dry extract) from fresh Echinacea purpurea (L.) Moench root (1:11). Extraction solvent: ethanol 65% v/v. Contains sorbitol and sucrose.